Thursday October 10th 1889 I hurried through with the work and the ironing this morning before. Lif Stevens and her cousin came we had a nice visit with them. I went to town after they went home but did not see the student who is doing my work. 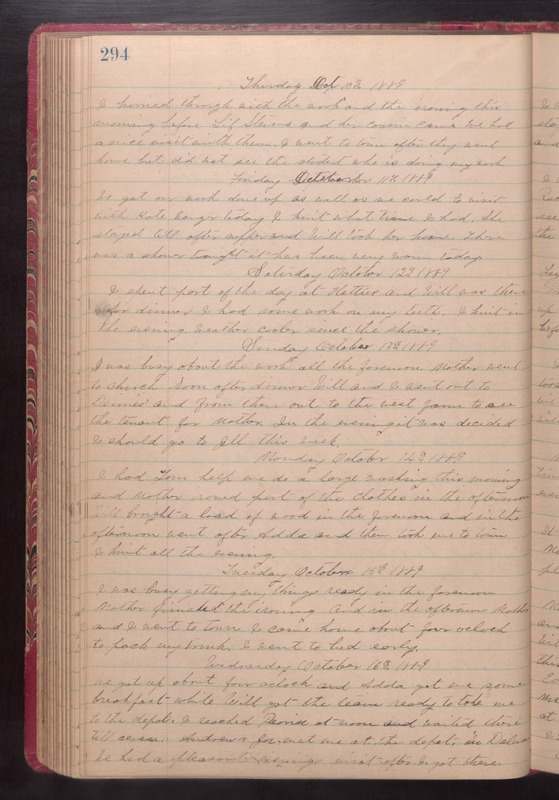 Friday October 11th 1889 We got our work done up as well as we could to visit with Kate Wenger today. I knit what time I had. She stayed till after supper and Will took her home. There was a shower tonight it has been very warm today. Saturday October 12th 1889 I spent part of the day at Hatties and Will was there for dinner. I had some work on my teeth. I knit in the evening. weather cooler since the shower. Sunday October 13th 1889 I was busy about the work all the forenoon. Mother went to church. Soon after dinner. Will and I went out to Dennes' and from there out to the west farm to see the tenant for Mother. In the evening it was decided I should go to Ill [Illinois] this week. Monday October 14th 1889 I had Tom help me do a large washing this morning and Mother ironed part of the clothes in the afternoon. Will brought a load of wood in the forenoon and in the afternoon went after Adda and then took me to town. I knit all the evening. Tuesday October 15th 1889 I was busy getting my things read in the forenoon. Mother finished the ironing And in the afternoon Mother and I went to town. I came home about four Oclock to pack my trunk. I went to bed early. Wednesday Octyober 16th 1889 We got up about four oclock and Adda got me some breakfast while Will got the team ready to take me to the depot. I reached Peoria at noon and waited there till seven. Andrew I Joe met me at the depot in Delavan. We had a pleasant visit after I got there.